The transponder consists of a resonator and IC circuit which includes a processor and non-volatile memory, embedded into the ignition key or remote transmitter. A separate power supply is not required as the transponder derives its power from an induced signal, at the correct frequency, emitted by the antenna ring from the immobilizer control module. When the resonator circuit receives a signal at the correct frequency it generates sufficient power to enable the IC circuit and processor to operate and to transmit its identification code. 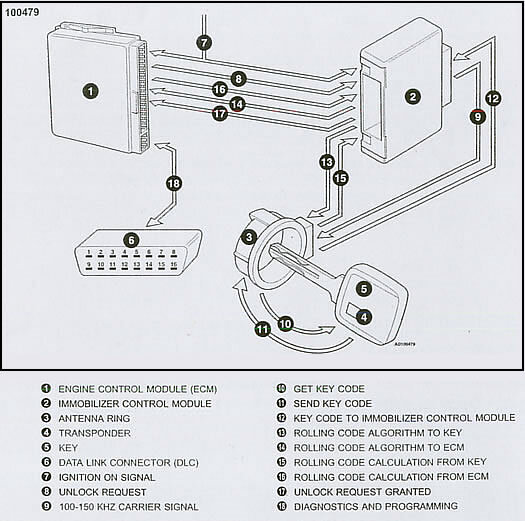 Each transponder ignition key or remote transmitter has a unique code out of a possibility of millions of combinations. The antenna ring is a coiled wire (aerial) located around the ignition lock assembly. It has two functions, the first being to transmit a carrier frequency signal, usually in the 100-150 kHz range, from the immobilizer control module to the transponder. The second is to transmit the identification code of the transponder back to the immobilizer control module. The immobilizer control module can be a stand-alone component or its function can be integrated into other control modules. It communicates with the antenna ring around the ignition switch and the engine control module (ECM). When the ignition switch is turned to the ON position, a carrier frequency signal is sent to the antenna ring around the ignition lock assembly.Some systems have the ability to adjust the frequency of this signal, up or down, to ensure trouble-free communication without interference from other signals. The engine control module (ECM) needs special software designed for immobilizer system operation. To enhance security and prevent components from being swapped from another vehicle, the immobilizer control module will only be able to communicate with the ECM that it recognizes and is registed with it from new. When the ignition is switched on and an attempt made to start the engine the ECM sends an unlock request to the immobilizer control module. The immobilizer control module outputs a 100-150kHz carrier wave to the antenna ring. This signal is induced into the transponder. The transponder responds to this induced signal by outputing the key code identification which is transmitted back to the immobilizer control module via the antenna ring. This key code identification is then compared with the stored code in the immobilizer control module memory. At this point the immobilizer control module only recognizes this as one of a series of registered keys. To further increase security, the immobilizer control module transmits a random code to the ECM and the key transponder and trequests an algorithmic calculation to be performed. The immobilizer control module also performed. The immobilizer control module also performs this algorithmic calculation independently. The ECM and key transponder return the answers of the algorithmic calculation to the immobilizer control module. A comparison is made and if they match, the unlock request is granted. If any of the calculations do not match the unlock request is denied, the engine will not start or, if already started, will stop. This authentication procedure happens so quickly that the driver may only be aware of a very slight delay between the key being turned and the engine starting. The immobilizer system is automatically reset when the ignition is switched off and the key withdrawn from the ignition switch. Many immobilizer systems deature fault memories which can be accessed in various ways e.g. by counting immobilizer warning lamp flashed, bridging data link connector (DLC) terminals with voltmeter or LED tester, or using suitable diagnostic equipment. This procedure is used on the immobilizer control module to ensure that it recognizes the signal emitted by the transponder.